The Wiener Staatsoper’s second new production of the season, Alcina, premieres on Sunday. The production’s biggest news is the inclusion of a visiting orchestra in the pit (Les Musiciens de Louvre). But let’s look at Adrian Noble’s production for a minute. There’s an article about it in this month’s Wiener Staatsoper magazine. It’s only in German, but I’ve taken the liberty of translating parts of it. This lady with the impressive headgear is centrally involved. The basics: Adrian Noble is principally a theater director and led the Royal Shakespeare Company for over a decade. His previous opera productions include a very good Ritorno d’Ulisse and a not so good Macbeth available on DVD. As far as I can tell this will be his first Handel opera; it is also his Wiener Staatsoper debut. Alcina, based on an episode from Ariosto’s Orlando furioso, premiered in London in 1735 and is also one of his most popular operas today. It is not in fact their first Baroque opera (Dido and Aeneas, 1927; Giulio Cesare, 1957? ; L’incoronazione di Poppea, 1969) but it is the first since the HIP movement got going. The cast will include Anja Harteros as Alcina, Vesselina Kasarova as Ruggiero, Veronica Cangemi as Morgana and Kristina Hammerström as Bradamante. You can watch a very short rehearsal video here. Here is what the article in the Staatsoper magazine says about Noble’s production. You can read an excerpt of the article in German here (including this passage), but it seems like the full November magazine hasn’t made it onto the Staatsoper’s website yet. That’s the most concrete thing he says. The Duchess of Devonshire was indeed a fascinating figure and there are other reasons to believe she would be a good candidate for Alcina other than the ones he mentions. She followed the conventional role for women of the time in some ways (she was a socialite, she was known for her beauty) but not others (she was far too directly involved with politics, she had lots of affairs). 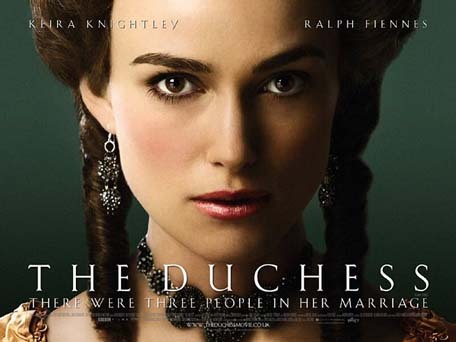 Incidentally, she was also the subject of a recent mediocre–is there any other kind?–Keira Knightly movie, The Duchess. 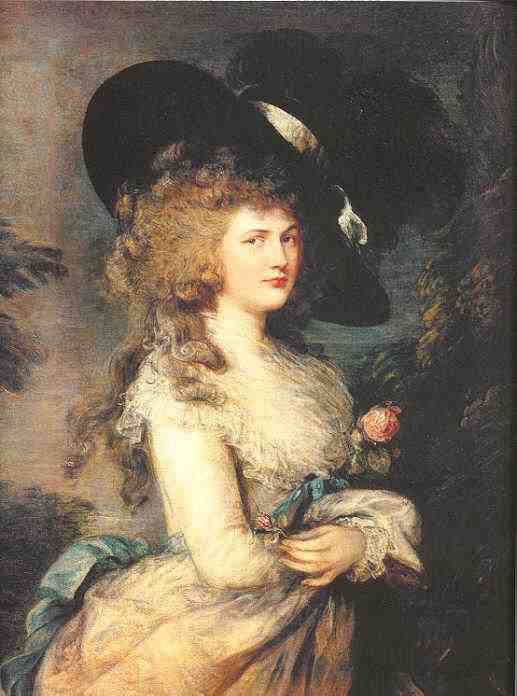 The portrait of her at the top of this post is by Gainsborough, she made the giant hat a fad. 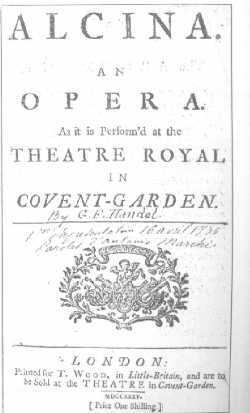 While imagining aristocrats performing a whole Handel opera is pure fantasy (Handel was truly the stuff for vocal freaks of nature, according to 18th-century London), there is a loooong historic tradition of the idle rich performing music for their own amusement and political maneuvering. In the 18th century, these giant spectacles were more common in France than Britain, but England isn’t that far from France and, unsurprisingly, women in Britain were in the middle of it. Whether this will work onstage is a totally different question, though. It reminds me frighteningly of Mary Zimmerman’s Met Sonnambula, and we all know how that turned out (badly). The Duchess of Devonshire lived from 1757 to 1806, which puts this setting at least 40 years after Alcina’s premiere. There were serious aesthetic developments in this period. So if we’re going to be so specific about the setting let’s not pretend it’s contemporaneous! It isn’t! Not that that’s a problem, this isn’t a research project, but let’s be honest about it. But it makes me worry that anyone who assumes that 1775 is the same as 1735 might not appreciate the finer issues of the Baroque. That’s a lot of concept before you get to anything directly relating to Alcina. “Has a strong woman in the center who is entangled in complicated emotional relationships” could describe, well, most operas. I am sure that the Keira Knightly film is 100% historical truth, and it didn’t make me think of Alcina once. Despite these less than auspicious signs, I will be there on Sunday and hope for the best! Also, for an appearance of something resembling that hat.